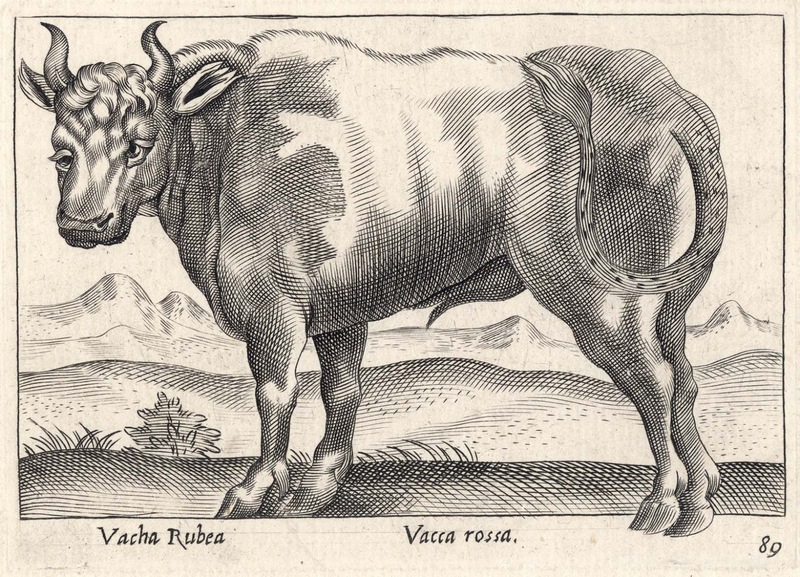 “Vacha Rubea—Vacca Rossa” (Google transl. 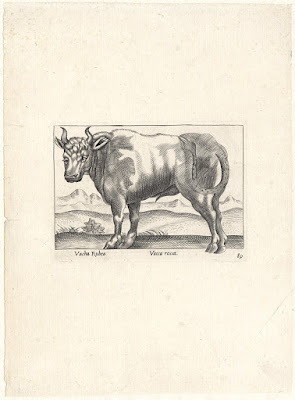 “Pink Cow”, but based on the penile sheath—or whatever it is called—and its big shoulder hump I suspect that this is a “Pink Bull”), c1620, plate 89 from the series of 206 plates, "Nova raccolta animali piu curiosi del mondo" (aka “Animals and mythical creatures”), published in Rome by Giovanni Giacomo de'Rossi (1627–1691) in or before 1650 (arguably with papal privilege from Pope Innocent X). 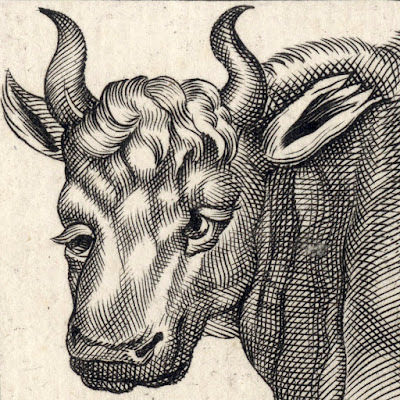 Etching and engraving on early laid paper with large margins backed with a support sheet. State ii (of ii) with the addition of the plate number at lower right. Condition: crisp and well-printed early impression still retaining the lettering guide-lines in superb condition for its considerable age, with only a small closed tear at the binding edge of the sheet at centre-left and a light diagonal mark (perhaps a flattened fold) at the lower-right corner. I am selling this rare early print of a bull that I suspect would have appealed to Picasso and the Cubists regarding the rather startling placement of the animal’s eyes, for AU$208 in total (currently US$150.85/EUR129.96/GBP113.88 at the time of posting this listing) including postage and handling to anywhere in the world. In earlier posts I have showcased a few other etchings by Tempesta of animals that one doesn’t often see. 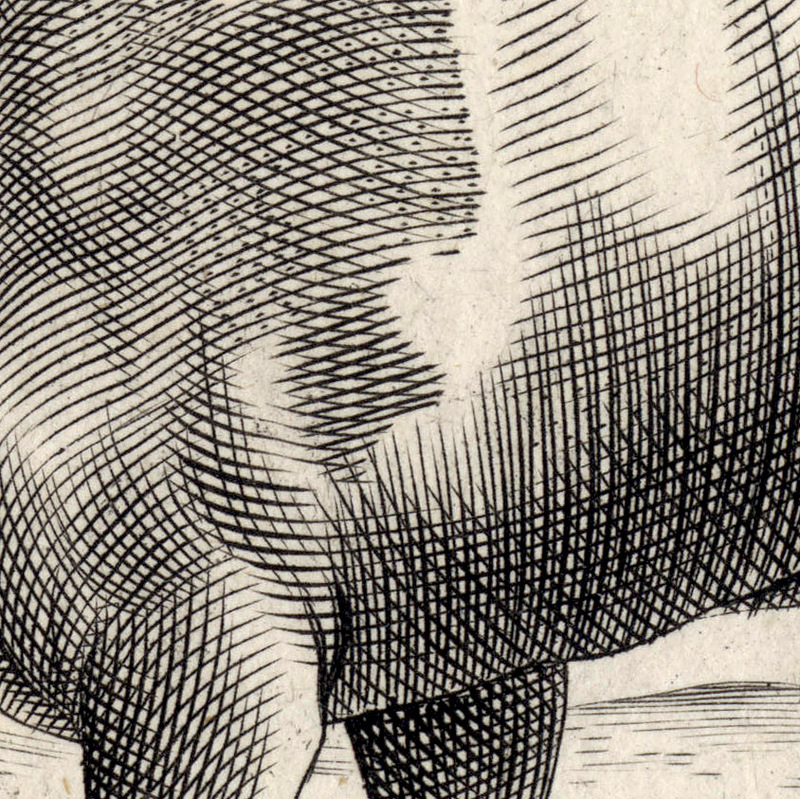 For example, in one of his animal prints Tempesta featured a hippopotamus cleverly disguised as a beaver (see http://www.printsandprinciples.com/2016/12/antonio-tempestas-17th-century.htm). 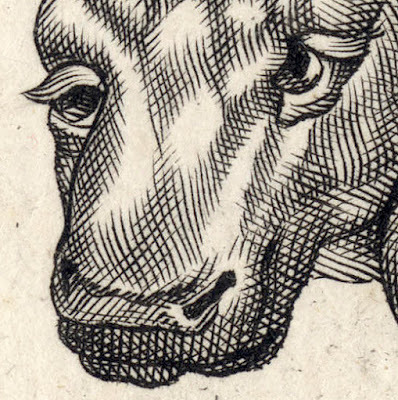 In another, he shared his fantasy by portraying a half dog and half goat having a wonderful time leaping around while being watched by a two-headed, six legged donkey (see http://www.printsandprinciples.com/2017/08/antonio-tempestas-etching-capras-canis.html). With Tempesta’s etched drawing of the head of this “Vacca” (in translation a cow but I see it as a bull) that is described as “pink” in the lettered title (again the translation may be inaccurate and the poor animal is not really pink but rather a “normal” bovine red) is riveting to look at. 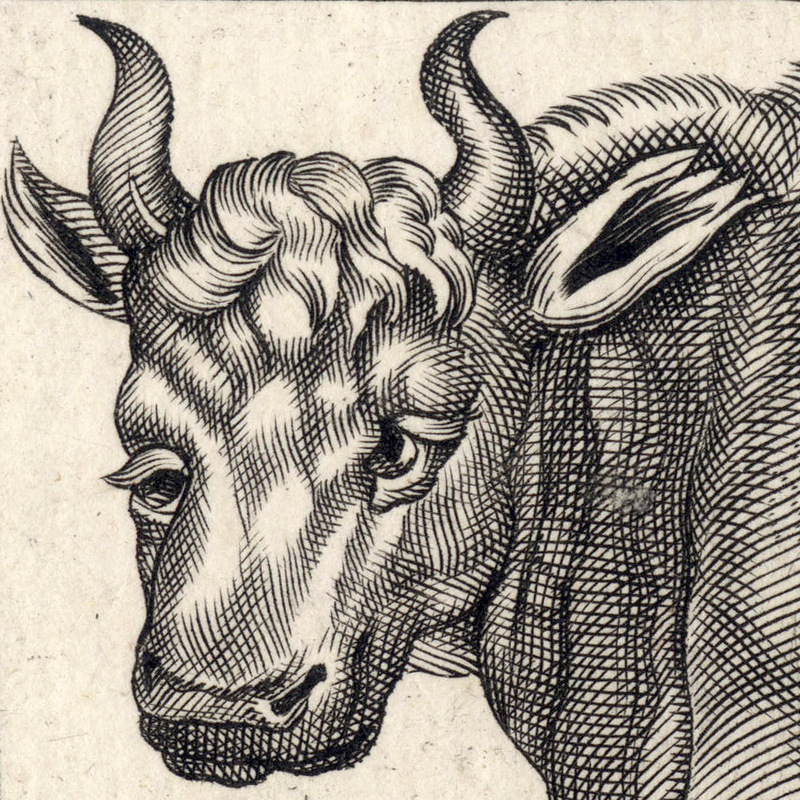 In fact, I find that the faulty alignment of its eyes is so fascinating that I have difficulty looking away. 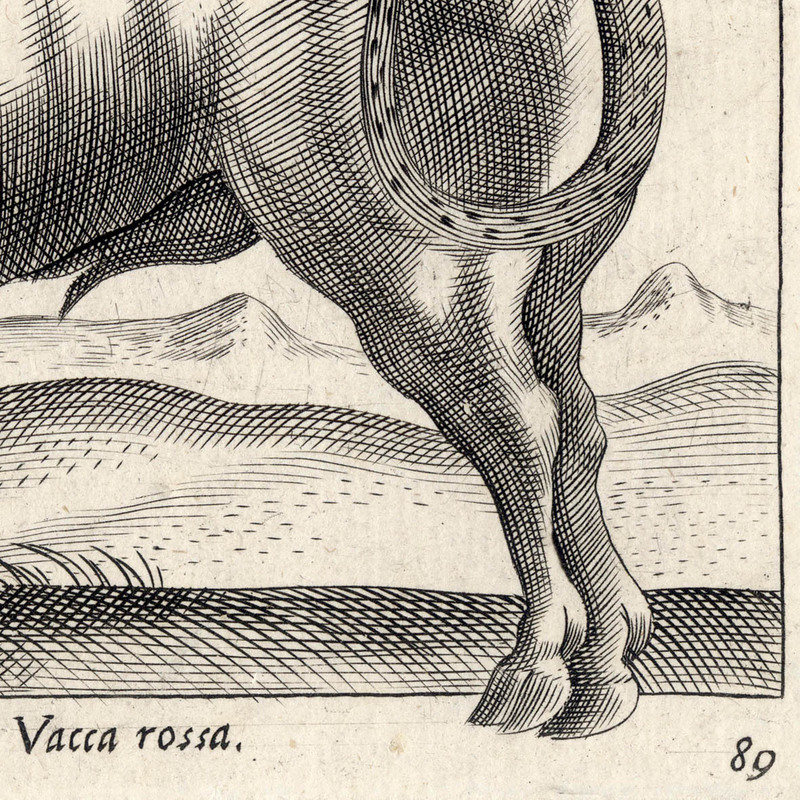 Beyond the curious face of this “Vacca” that only its mother could love, I wish to point out another equally curious element in this composition: the placement of the animal’s rear hooves “outside” of the frame. 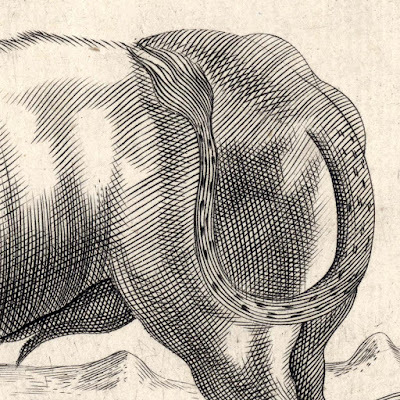 From a personal standpoint, I find this placement very disturbing. 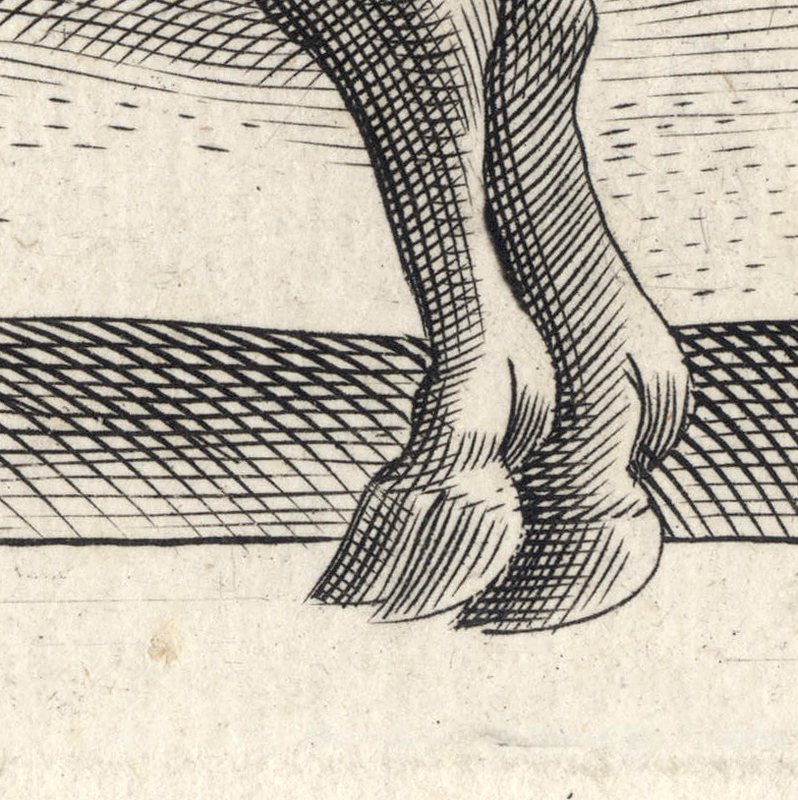 I do not believe that Tempesta simply made a mistake and ran out of room to fit the feet into the picture. After all, this is a late print by Tempesta and a lifetime of experience would not allow for such an elementary mistake. Instead, I believe that the artist wanted the viewer to feel spatially challenged by this Vacca; a challenge in which the awkward placement of the hooves makes the animal inhabit not only the picture space within the frame but also to intrude into the viewer’s personal space.